Link 41 will have sausages for sale next week. If you are like me, you may be wondering when you can next stock up on Link 41 sausages and bacon? They will only be coming up once a month in the coming months so I wanted to give you an advance warning. They will have products for sale to order next weekend. Consider your holiday list now so that you’ll be ready to order for next week. Also remember, next week will be the last week of the market until January 8th. Make sure you plan accordingly! Bookings for holiday baking are beginning to fill up. In the past, we have not been able to meet our online customers needs. So, we will reserve a spot for our customers if you will email us your order at jborab@blomand.net. Please specify the item and pick-up date. I will ask Jess to place the order for that delivery date. Thanks. It hardly feels like December and the local strawberries haven’t helped… but they sure have been fun! If you missed the strawberries from Daylily Nursery last week be sure to get some this week. They are greenhouse grown and quite tasty. Looking for holiday gift ideas? Share the beauty of your community with family and friends this holiday season! Filled with pictures from Tracy City and the surrounding area, the Discover Together 2013 calendar is a collection of photos that documents the adventures of kindergarten-2nd grade students participating in a two-week summer camp, Camp Discover, at Tracy Elementary. Share in their adventures as they explore the South Cumberland State Park (Fiery Gizzard, the Natural Bridge, and Grundy Lakes) and other notable local landmarks, including Sewanee: The University of the South, the Grundy County Historical Society, and more! Tips for families and children that highlight ways to connect with one another and the community are featured each calendar month. The Discover Together calendar will make a special gift for adults and children alike. You may obtain a calendar through the Cumberland Farmer’s Market. A donation is being asked for each calendar. All proceeds from the calendars will be used to fund future Camp Discover activities in Grundy County. For more information about Discover Together programs, email: southcumberlandfamilies@gmail.com. The Discover Together calendar was made possible by a generous donation from Scholastic. Discover Together and Camp Discover are part of an ongoing collaboration between Scholastic, Yale Child Study Center, and Sewanee: The University of the South. Petalland, Farmer Brown’s, Tom’s Naturals, and White City Produce all have wreaths and greenery available. Chickweed has Yule Log Cakes for sale! If you’ve tasted Elizabeth’s baked goods you’ll know that this is going to be a truly special cake – perfect for a holiday party. Speaking of Holiday Parties, IvyWild has the savory treats, Smoked Duck, Smoked Salmon, and Tasso Ham. Of course, all of the old favorites are still available and there may be a few new things I have missed too. Holiday Closings December 25th and January 1st. 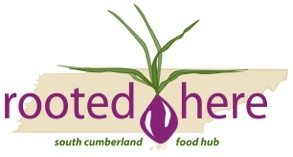 The Cumberland Farmer’s Market will be closed this year for both of these holidays (which fall on Tuesdays). Make sure to stock up ahead of time on all your local favorites. I’m on the road right now so please excuse the abbreviated newsletter. It’s time to order at http://sewanee.locallygrown.net/market. Exciting this week: Hydroponic strawberries from Day Lily Nursery in McMinnville! I tasted them last week and they are as sweet as spring. Quantities are very limited. Enjoy a December treat! Farmer Brown is running a special on Bibb Lettuce for $2 a head this week. Please note that the CFM market will be closed on Christmas and New Years Day this year as both of these fall on a Tuesday. Be prepared and stock up ahead of time on all your needs for holiday meals. Tom Melton on Clouse Hill Road, between Tracy City and Monteagle, has Christmas trees available again this year. You can pick them yourself or he can help you. Call him to learn more. His home number is 592-4434 and his cell is 235-5207. Michael Raines will have extra eggs from Wayne Diller’s Farm (Nature’s Wealth)available for sale at the market today. 4:30 – 5:45 pm, at the Sewanee Community Center. Time to order a local Thanksgiving feast! This is my favorite way to prepare sweet potatoes because it is so easy! Wash whole sweet potatoes and place them in a roasting pan. Drizzle with olive oil and sprinkle with kosher salt. Cover the roasting pan and place in the oven. Check on them in 45 minutes. Happy Thanksgiving! I hope that you enjoy the amazing local bounty! Fountain Springs Farm has fresh turkeys for sale. They will be delivered fresh on Tuesday. Please note that if you have ordered a turkey deposit you do not need to also order a turkey. Eric or Suzanne from Fountain Springs Farm will be in touch with you directly to find out which size turkey you would like. These turkeys will also be delivered fresh on Tuesday. I have not had time to check out the market list yet so I’ll encourage you to browse the whole list. I’m passing along the following information on behalf of the Sewanee Community Center. We sure appreciate the support that they provide for us. Please consider supporting them with your membership. The Board of Directors of the Sewanee Community Center is having a membership drive for 2013 and invites you to join the Center. Completion of the membership form below will put you on the roll. Cards are also available at the Community Center. Membership is open to all residents of Sewanee and the surrounding area. Members are entitled to organize events at the Center and may run for the Board of Directors and elect future Board members..This drive will continue through November. In December, an election for open seats will occur. The Sewanee Community Center provides a meeting space for community groups and clubs, hosts the Tuesday’s Farmers’s Market, provides space for yoga, gymnastic, dance and other classes and is available for private parties. Looking forward to having you join! The market will operate as usual on the week of Thanksgiving with pick happening on Tuesday the 20th. The market is open for ordering at http://sewanee.locallygrown.net/market. A newsy Thanksgiving email will be coming soon (I’m running late). Fresh Turkeys are available this week – more info to come in the email.